Discussion in 'iPhone and iPad Games' started by redribbon, Nov 27, 2015. No in-app purchases and hidden fees. Pay once and play without restrictions and advertising. •	Winner #1 in the category APP OF THE YEAR 2015: Players Choice at SLIDE DB (slidedb.com) •	4.5/5 - 4pda.ru - "Neat and addictive puzzle game, recommended for anyone with children." (Comment: translation) •	8/10 - Games.Mail.ru - "The heroine travels through a colorful world, which, despite its visual appeal, is full of dangers, robbers and mysteries." (Comment: translation) •	AppleInsider.ru - "Colorful graphics, familiar characters and interesting tasks guarantee an exciting time and lots of fun." (Comment: translation) Supported devices: iPhone 5 and newer, iPad 4, iPad mini 2, iPad Air, iPad Pro and newer, only iPod Touch 6th generation. Supported languages: English, German, Russian, Japanese, Korean, Simplified Chinese. At dawn, the windows opened! The pigeon flew into the room with a letter from Grandma, calling to start a journey, an incredible adventure! CHARMING ADVENTURE! 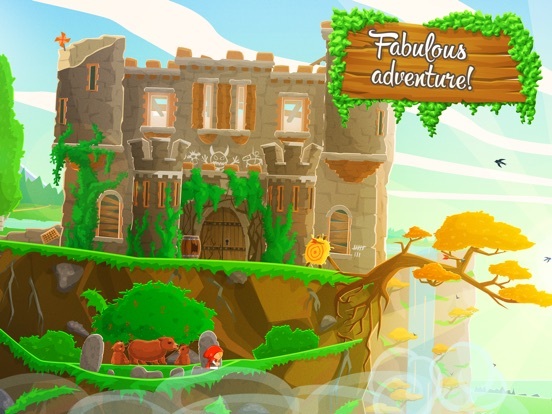 Welcome to Brave & Little Adventure – a charming, colorful medieval adventure of Little Red Riding Hood! 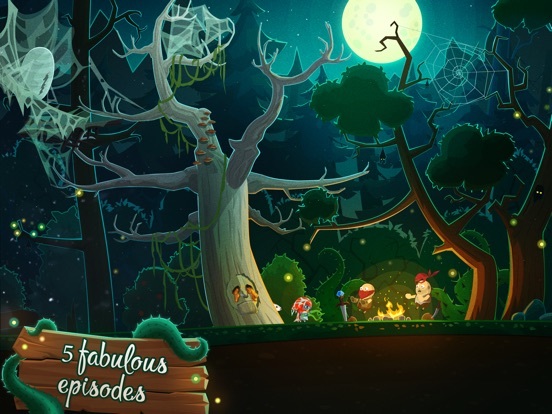 Walk through Sunny Fields, explore the ancient ruins in Fairy Gardens, solve non-trivial puzzles, don’t get lost in Darkwood and reach Stonevill town through saturated 5 eventful episodes, and daredevil Hans will help you in this! 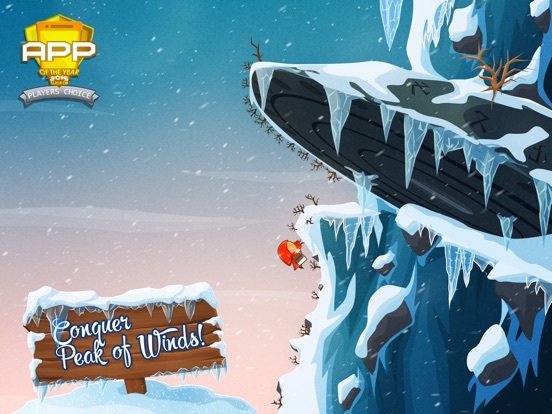 CONQUER PEAK OF WINDS! Plunge into a fabulous, fascinating, intriguing story with a cheerful little girl named Molly! Conquer the great Peak of Winds and get sacred Edelweiss for you Grandma! VISILE ENEMIES, TRICKY PUZZLES AND PILES OF SURPRISES! Find gifts for yourself and for Grandma, scattered at every step! But be careful, Big Bad Wolf is watching you! Help people and animals, give a good lesson to the villains, but don’t get caught! Will you manage to get away from bears, bandits and even werewolves? TINY, BUT SO BRAVE! 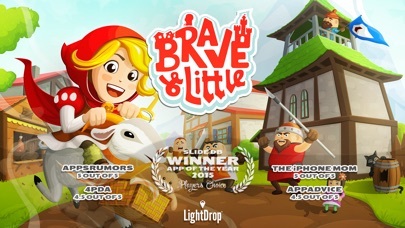 Brave & Little Adventure is a medieval adventure based on the fairytale about Little Red Riding Hood in the Point-n-Click genre with Stealth and Hidden Objects elements. 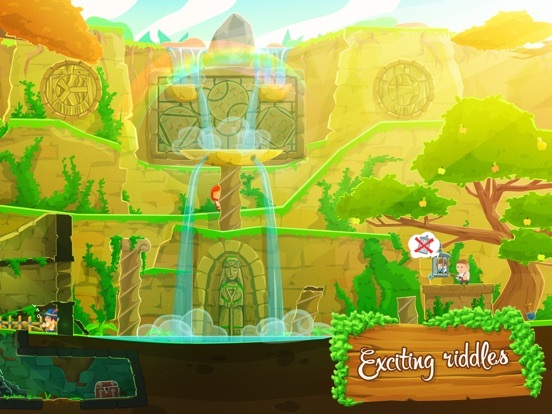 YOU WILL GET: - Wonderful sense of humor and a great adventure; - Mysterious riddles and attentive enemies; - Over 30 unique characters; - 23 fully interactive, hand-painted and unique locations; - Over 50 hidden artifacts, objects, goodies and gifts; - More than 1,500 different types of animation that make the story incredibly alive; - Fairytale about Little Red Riding Hood, which you have never heard before. 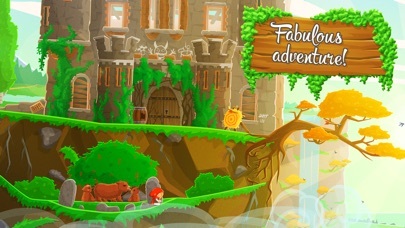 With courage at heart, Molly is ready for a fabulous, fun and mysterious adventure, and you? System Requirements: iPad 4, iPad mini 2, iPad mini 3, iPad mini 4, iPad Air, iPad Air 2, iPad Pro or later. iPhone 5, iPhone 5c, iPhone 5s, iPhone SE, iPhone 6, iPhone 6 Plus, iPhone 6s, iPhone 6s Plus or later. iPod Touch 6th generation. Operating system: iOS 8, iOS 9, iOS 10 or later. 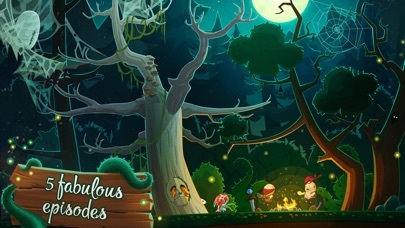 this game feels like a twin brother to tiny thief, with imo, even more beautiful artwork. great and brilliant puzzle. i dont know who this guy is but he really did an amazing game here. just hit the buy button if you are truly a tiny thief's fan. This should really get more attention...smh. 5star game . This needs promoted more. Developer have a Twitter ? Is there any in-app purchases in this game? Can't find any info. Is this episodic? There is mention of this being the first episode. Are the remaining episodes (if exist) coming as a new paid game or add-on? agreed. the iap are to get more clues. 0.99 for one clue, 1.99 for 5 clues, and 4.99 for unlimited clues. Yeah, this is really, really good. I mean, like RR said above, it's essentially a Tiny Thief-like, but since you can never have enough TT, this is a very, very good thing. You can get free hint everyday. The 6th episode will be come as free update as well. Found some minor bugs such as missing textures in some parts and low res assets. Bought the game on full price, well kinda a bummer for knowing this get a price drop not even a week after released. However seems sales didn't go well. Gamezebo have covered about this, but I think more people need to know about the game. I think basically anything released this week was doomed to fail with Thanksgiving in general, a focus on sales and a late App Store refresh. It's mind-boggling to think something of such high quality wasn't even featured. You did a good thing by buying it full-price. Believe me, I know it stings...but in the end you supported the developers by paying what they wanted the app to cost and not the result of something they were forced to do. It's obvious this game was a labor of love (seriously, you don't pack this much charm into a game if you don't give a ****) and is easily worth the $3. Don't feel bad. yep i bought it at full price and its worth every penny. i think people will eventually know that the developer put so much love into this game. every thing is so detail even the animation are great. and now for 0.99? cmon guys, if you dont like this game, i can easily pay it for you . support this developer and i guarantee you wont regret it. ps. @copaeci, what device are you playing on? any bugs you mentioned above does not occurred on my device. im on 6s plus. maybe the developers will fix it on the next update. Actually the game was released on Thursday. However, for some reasons it didn't pop up on NZ on Wednesday night. 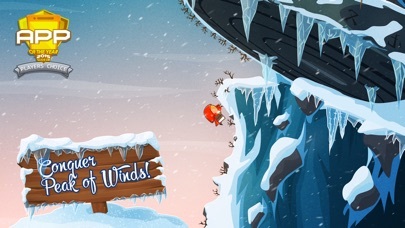 I know about this game from Gamezebo, then found their slidedb page and get the download link from there. Yes, I didn't mind to pay a full price for a game that deserved it. However, may be a dev should more confident with their pricing tier. Like Prune dev said on their twitter indie dev should be brave and proud with their work. @copaeci, what device are you playing on? any bugs you mentioned above does not occurred on my device. im on 6s plus. maybe the developers will fix it on the next update. I played on iPad Air, iOS 8.4.1. Have you reach level 14? Well, probably this only happened in iPad. It's happened on my Air 1st gen, iOS 8.4.1 too. Is it just me that there is only a single opportunity to tap on the hiding wolf to score the achievement for each level? 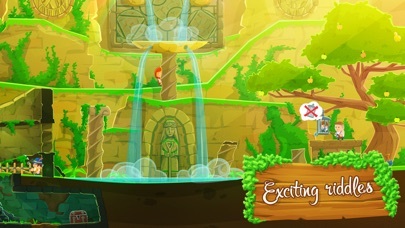 If you miss the first disappearance and the wolf hides, it would not appear again for the level unless you reset it (this differs from the levels in which the wolf's position is static). Thank you for such interest in our game, we are very pleased. We are aware of the technical problems and are already preparing a new update. A future update will primarily fix poor-quality graphics on iPad. We will also prepare localization in German and many small improvements. The update will be available in about 2 weeks. We apologize for the abrupt change in the price. We had to cut the price for a few days to test the elasticity of demand. Of course, it's not good to those who have already bought the game, but I hope our gamers will understand us. Unfortunately we did not get any support in the days of release and did not even appear in the new category. This is why we have low sales. We have invested a lot of time and effort in Brave & Little, and we are even pleased by the fact that it is compared with Tiny Thief, because Tiny Thief is one of the best games in the last 5 years. 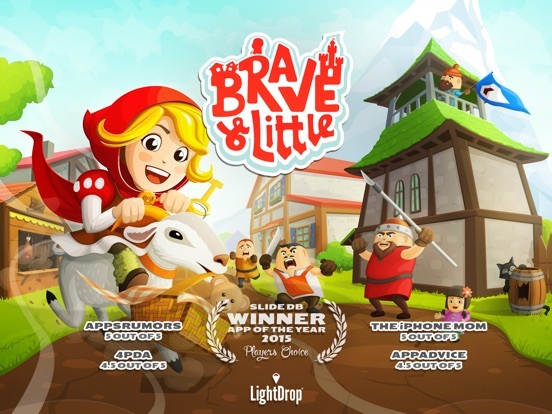 Nevertheless, Brave & Little is a completely independent game, which is not related to Tiny Thief. We are going to release the next game, which will be much greater than all the games of this genre, but we cannot do this until Brave & Little has achieved success. I put it on my watch list. When the update comes out I'll be happy to buy full price. Will this game run on an iPod touch 5th gen? In the apps description it only lists iPad and iPhone requirements from what I can see. iPad 3, iPad 4, iPad mini 2, iPad mini 3, iPad mini 4, iPad Air, iPad Air 2, iPad Pro or later. iPhone 5, iPhone 5c, iPhone 5s, iPhone 6, iPhone 6 Plus, iPhone 6s, iPhone 6s Plus or later. iOS 7, iOS 8, iOS 9 or later.